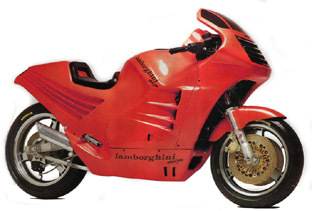 The Lamborghini Motorbike was designed in 1984-85 as a result of a close collaboration between Lamborghini and the French leading-edge racing bike constructor Boxer-Bike. Boxer Bike has been famous since the seventies for their sophisticated racing bikes: hand-built in Toulouse (the French Aircraft and Aerospace Valley) with extensive use of aerospace-technology, ultra lightweight frames theses motorbikes offered the highest performance. In 1986, in search of expansion and diversity, Lamborghini decided that a motorbike would bear their name. Boxer was the only partner capable of building the ambitious, ultra-expensive Lamborghini Design 90, powered by a state-of-the-art, 4-cam, 4 valve per cylinder straight-4 Kawasaki engine. The price was twice as high as the most famous high-end motorbike of the period. This outrageous price factor, in addition to the extremely limited series - Lamborghini announced that 20 to 25 would be built, but only a handful were actually completed - contributed to establish the myth of the Lamborghini bike. Chief Engineer for this bike was Claude Fior, famous for his unique high-tech racing bikes. Fior unfortunately died young a few years ago in aircraft accident. With an estimated 130 HP for 170 kg, and with its radical shapes, this bike was a dream for millions of enthusiasts. Five to possibly six of these exclusive motorbikes were ever built with the complete fiberglass dramatically aerodynamic bodywork, inspired by the world-famous "25th Anniversary" Countach. One is still owned by one of the founders of Boxer-Bikes. The market value of theses bikes, in perfect order, are estimated between $50,000 and $70,000 USD (£30,000 - £40,000).